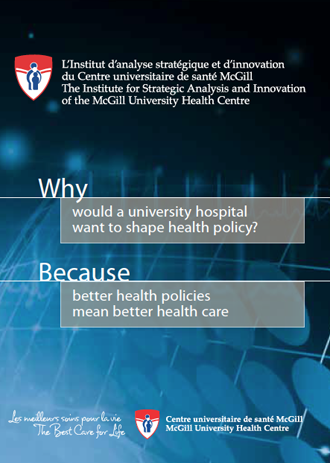 Formed in 2007, the MUHC Institute for Strategic Analysis and Innovation (MUHC-ISAI) is a unique in-hospital think tank. MUHC-ISAI activities help to clarify how health policies in Canada and Québec affect the hospital’s efforts to provide excellent care; they provide an opportunity to highlight successful programs and practices at the MUHC to internal and external audiences; and they strengthen existing and forge new links between MUHC personnel and counterparts from other provinces and countries. The MUHC draws on ideas and messages that emerge from ISAI activities to help take the steps, both inside the institution and in the broader community, that will sustain a tradition of excellence and help lay a policy framework for continued improvements. The MUHC-ISAI is endorsed by the MUHC Director General and led by his delegate. Ms. Patty O’Connor, Director of Nursing currently co-Chairs the MUHC-ISAI alongside Susan Usher, Director of the Health Innovation Forum (HIF). Mr. Harris Poulis, General Counsel and Director of Legal Affairs, and Mr. Richard Fahey, Director of Public Affairs and Strategic Planning, serve as members of the MUHC-ISAI Administrative Committee. Other senior personnel contribute their expertise and leadership to specific projects. The MUHC-ISAI benefits from the political insights of Special Advisor, Mr. Bernard Lord, former Premier of New Brunswick. The MUHC-ISAI identifies challenges manifesting within the hospital and partners with the HIF to explore solutions through consultations, case studies, discussion papers and conferences. They research the issues at hand, look at solutions implemented in other jurisdictions, and assemble experts from different perspectives at events held within the MUHC. The MUHC-ISAI is self-financed and HIF raises the funds required to conduct activities from corporate and other donors. The companies that provide support are among the innovative enterprises developing programs and products that will help shape the future of health care. Through the ISAI’s Partners’ Advisory Council, company representatives are invited to share their insights into how innovation can most beneficially be incorporated into Quebec’s and Canada’s system.